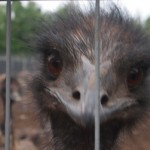 One of our last to-dos in Minnesota was to tour a working emu ranch. Why? Why Not? We had obviously never been on an emu ranch, and besides our limited individual experience with dairy cows, we had never even really been on a working ranch of any kind. When we saw this listed on roadsideamerica.com we were very excited! Unfortunately, we forced to drive the RV as this place was on the way to our campsite near Fargo, North Dakota. Our trusted GPS got us there, but it can’t be blamed for the city or the county’s lack of foresight into the precarious process of driving an RV on subpar roads. The county roads were often at best thick gravel, and at worst slippery-wet dirt roads. Of course the lady on the GPS can’t be blamed as she has no way to warn us and once we’re moving in a direction, it’s quite difficult to back up. Rarely are the dirt roads wide enough to turn around, so Kimmer called the Emu Ranch to verify we were on the correct road and that we would be able to spin around our monstrous load. Moments later, we were happy to see the sign for the Heart of Minnesota Emu Ranch. Worried when we parked, Kimmer talked to the owner Patty Constans, and she showed us that they would open a gate with a turnaround to accommodate our return trip. Wheh! With that over, we grabbed our stuff from the RV and headed inside for the tour. The building she led us to was under construction, but this just added to the clutter that we think filled life at a Emu ranch – paperwork, boxes and emu-related items were strewn about. Patty sat us in two plastic folding chairs upon the plastic covering their construction site in a large empty room – which may ultimately become the showroom. She apologized for the mess. Patty, friendly, warm and manic woman in her fifties, began her presentation with a little lesson on emu oil and its health benefits. We were initially confused as we wanted to learn more about the birds, but she reassured us that that was coming. She showed us many different of her company’s products and shared both medical and anecdotal evidence of their success with each sample. The emu lotions (nicknamed “facelift in a bottle” by one customer) are very moisturizing and are made naturally with no artificial ingredients. She also gave us a little background on how her husband got into emu ranching. After retiring as CPAs, and a quickly opening and closing a security business, they came across some emu ranchers at a show and quickly bought land to start raising emus for emu oil. Patty is quite sincere when telling us about the oil, and I think her passion is very real – she wants people to love this product as much as she does. After about thirty minutes, Patty finally led us to the emus and rheas. As soon as we arrived inside the gate we saw striped emu and the bright white rhea chicks, both only a few months old, but already larger than a chicken. The emu chicks will lose this striping as they grow older. We were then led over to the adolescent and adult enclosures. Emus are curious birds, often dancing about to grab attention. We were mostly struck by how lizard like these great birds were. Tall and graceful, when they run you can only envision the giant raptors of Jurassic Park tearing after prey. Of course, these birds rarely “hunt”, but they can reach speeds of up to 40 mph in short bursts. Upon processing, the meat from these birds is very high in protein, but their high fat content is the key for the oil business. As much as 98% of the bird will be used, and scientific research is constantly being sponsored to look into other uses. In fact, Emu corneas are being tested for human corneal transplants. We snapped a few photos, talked some more with Patty, purchased a few sample oils for trial and got on the road. This tour was interesting, but I wish I’d been more prepared for the sales pitch that was coming. For more information, or to schedule a tour, click here. these birds are cute, the last picture you took is adorable…..he looks like he should be in a cartoon or something. Pick me up a jar of that face lift cream will ya?